The Medicinal Garden is a theme garden situated amidst the delightfully colourful and interesting architecture and traditions of a local ethnic people, the Ndebele. 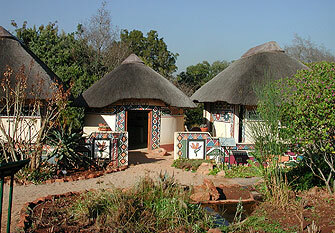 The garden is developed around a central hut which, according to Ndebele tradition, represents the soul of the women of the house. The walls of the buildings have been painted in the traditional style by three talented Ndebele women from a local community. Incorporated in the designs are stylised motifs, such as the Strelitzia flower representing SANBI, the Protea flower representing the Botanical Society of South Africa, an NGO and a sponsor, and some Guinea Fowl – one of the local grassland birds. The well-labelled plantings represent plants commonly used by traditional healers and the general public. The plants are grouped according to their medicinal uses. Water features and ponds are an integral part of the design and aid in the display of water-associated plants.